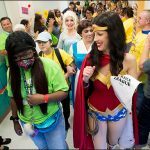 As part of National Childhood Cancer Awareness Month, Texas Children’s Bone Marrow Transplant Unit (BMT) was transformed for a few hours last week into a full-fledged parade route – music, costumes and all. 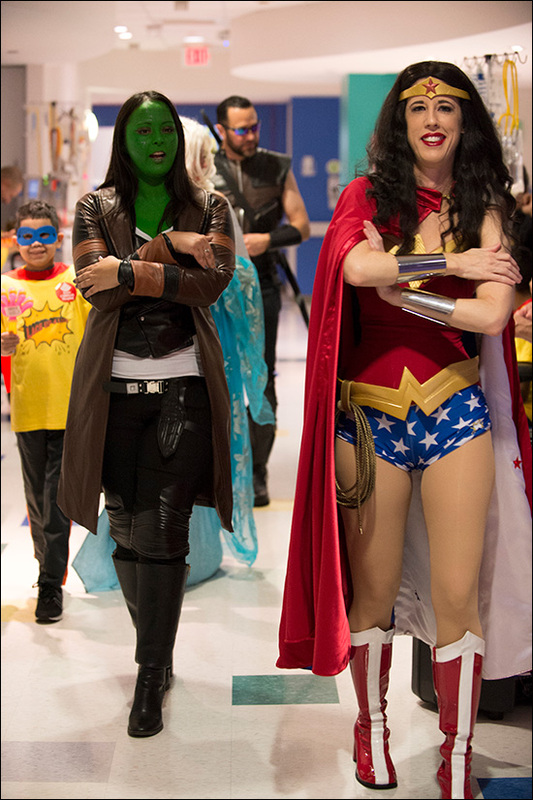 The Lace Up 4 Life event – hosted in part by Be The Match, which manages the largest and most diverse marrow registry in the world – began in the inpatient portion of the unit with patients dressed in super hero capes and costumes parading downs the halls with staff members by their side and cheering them on. 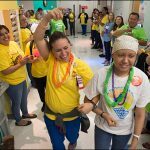 After several laps around the inpatient unit, patients retired to their rooms while the parade continued to the outpatient portion of the unit, pausing for a special announcement from Hope Guidry-Groves with Be The Match. 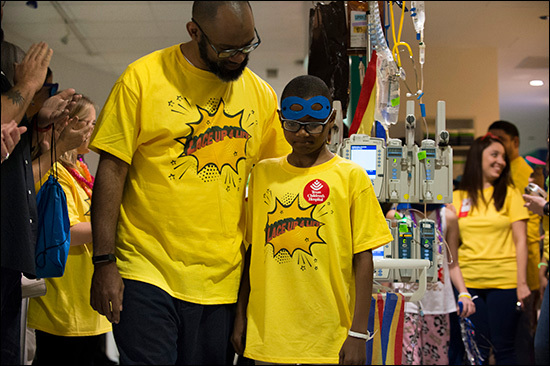 Jacob is a patient at Texas Children’s and so is Wallace’s son. When they first laid eyes on one another they quickly embraced in a long, emotional hug. Wallace told the audience that everyone should join the marrow registry. “There’s no reason not to,” she said. 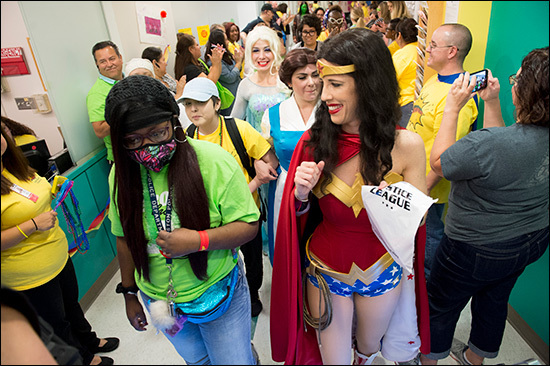 Texas Children’s Cancer Center has a premier bone marrow and stem cell transplantation program. 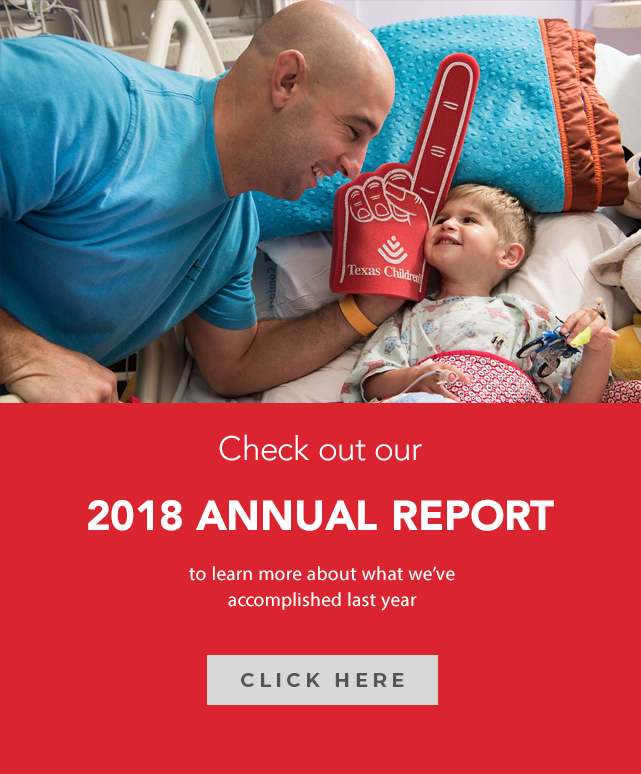 Our state-of-the-art, 15-bed inpatient transplant unit is among the largest of its kind in the Southwestern United States and focuses exclusively on transplantation. 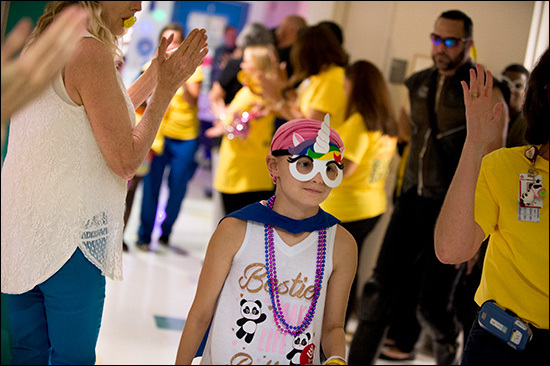 The Bone Marrow Transplant Clinic performs over 100 transplants per year. 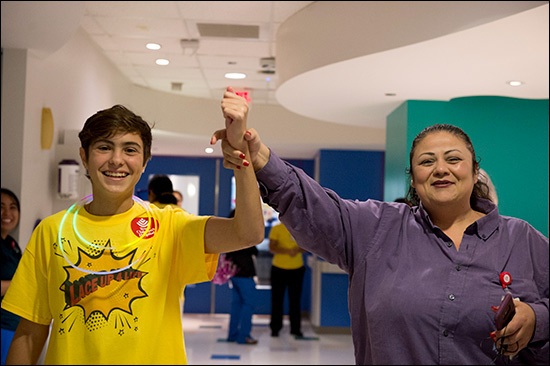 Texas Children’s works closely with Be The Match to find donors for our patients. 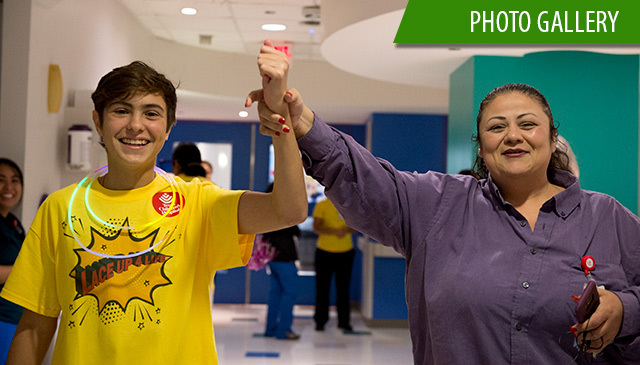 Learn how marrow donation works, the steps of a patient transplant, steps of donation, and factors that can impact the likelihood of finding a match here. 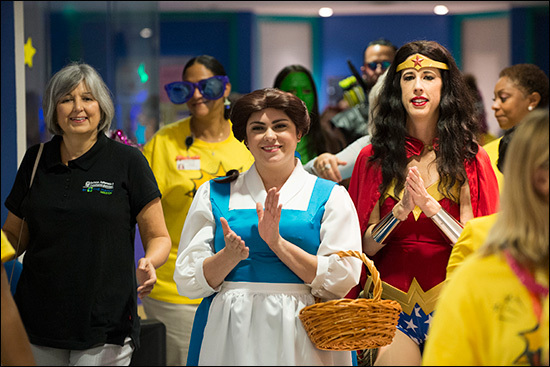 A marrow transplant may be someone’s only hope for a cure. Imagine you’re the parent of a newborn with an arm injury. During your admission you’re told not to move the arm and to protect it all times. 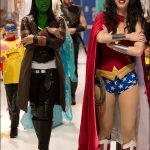 Now imagine coming back for your clinic appointment and hearing that it’s time to start moving the arm at home – unsupervised. For parents of children with brachial plexus birth palsy, this moment can be daunting. Brachial plexus birth palsy occurs when there’s a stretch or tear in the bundle of nerves known as the brachial plexus, located near the neck and upper arm area. These injuries may cause weakness, pain, sensory loss and functional impairment. Sometimes the nerves need time to recover, anywhere from a few days to a year. Other times surgery might be required. Regardless, a focus on treatment during the waiting period can help prevent the shoulder joint from becoming stiff. The only way to keep the joint loose is through passive exercises, which must be performed early and often by the patient’s family. 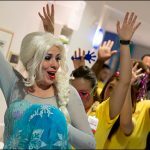 To help empower parents, Texas Children’s brachial plexus clinic recently teamed up with engineering students at the Oshman Engineering Design Kitchen at Rice University to develop a model that allows parents to practice movement exercises in clinic before performing them on their children at home. 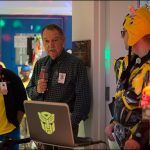 The project was part of an ongoing collaboration with Rice begun in 2014 by Texas Children’s Brachial Plexus Clinic Coordinator James Northcutt. Northcutt met with the students monthly to serve as clinical lead on the project, providing information about anatomy, biomechanics, caregiver needs, therapy concerns and overall device application. Less than a year later, design team “Can’t Brachius,” produced a professional and well-functioning prototype. But it needed to be tested by parents. Mayra Oliver was the first. When she was first told she’d need to perform exercises on her infant son, Raphael, Oliver was nervous and worried. But a demonstration of the model and the opportunity to use it herself had her feeling much more confident. Using a survey developed in conjunction with the Rice design team, Northcutt will begin conducting a randomized control study over the coming months to determine the device’s efficacy both in educating families and in preparing them for the performing the exercises at home. 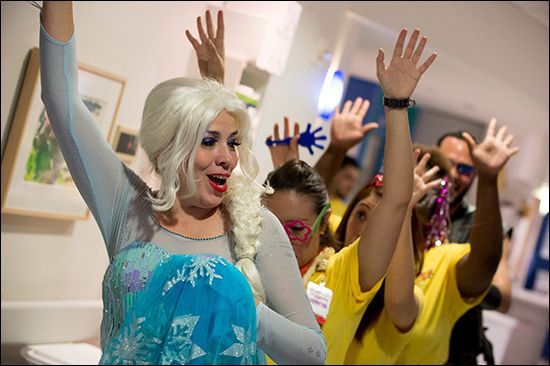 The Brachial Plexus Clinic is part of Texas Children’s Brachial Plexus Program, which comprises plastic surgery, orthopedic surgery, physical medicine and rehabilitation, and occupational therapy. The clinic provides comprehensive care for brachial plexus injuries including specialized assessment, developmental and functional screening, primary nerve surgery when indicated, secondary orthopedic surgery for the shoulder and lower arm when indicated, and preoperative and postoperative care in the therapy setting. The brachial plexus team provides high-level, evidenced-based care, utilizing ultrasound to monitor shoulder integrity in infants recovering from brachial plexus injury, providing specialized splinting for prevention of joint contractures in the arm, and implementing best surgical practices for primary nerve and secondary orthopedic procedures. 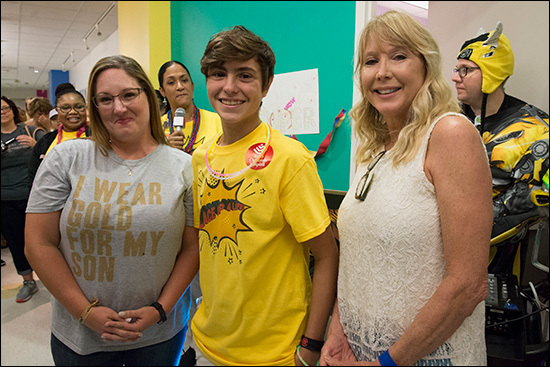 September is National Suicide Prevention Month and along with continuing to inform people about warning signs, Texas Children’s has recently elevated our prevention tactics with the use of the Columbia Suicide Screening Rating Scale (C-SSRS). According to the Columbia Lighthouse Project, C-SSRS supports suicide risk assessment through a series of simple, plain-language questions. The answers help users identify whether someone is at risk for suicide, assess the severity and immediacy of that risk, and gauge the level of support that the person needs. 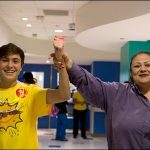 Texas Children’s is currently using the C-SSRS in all three emergency rooms for all youth over the age of 11 since March 2018, and to date we have screened more than 1,700 adolescents. Individuals who screen positive are given specific treatment plans based on the level of severity, including either further assessments by our psychiatry team or our partners, Mental Health Solutions. 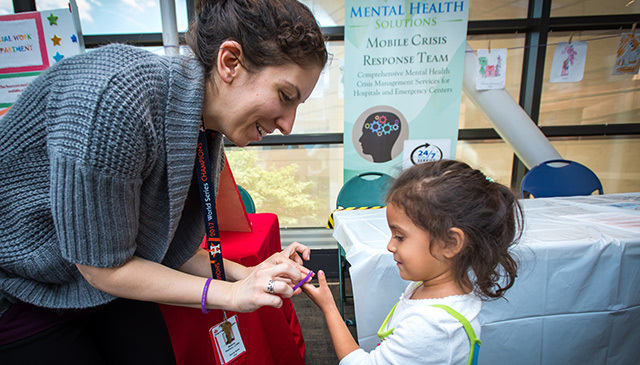 Mental Health Solutions is an outside team of social workers who will come to our hospital emergency rooms to assist parents. 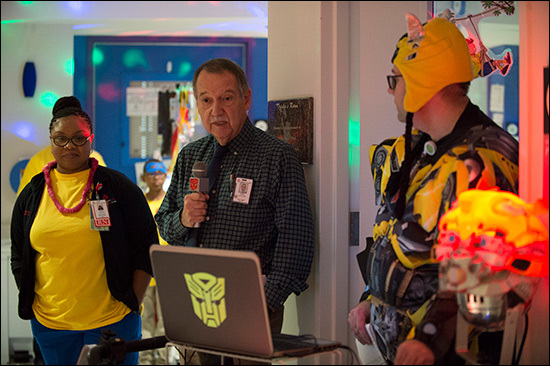 Their health care teams also locate appropriate locations for inpatient psychiatric care within Houston and surrounding counties for youth needing such specialty services. Suicide is the second leading cause of death in the United States among adolescents between the ages of 15 and 24. This is more than cancer, diabetes, cardiac and neurologic diseases and yet there is still a stigma attached to suicide. Over 450,000 emergency rooms visits annually are secondary to individuals who have self-inflicted injuries. Future plans for C-SSRS include screening other localities within our system such as specialty and general pediatric clinics in conjunction with depression screening. 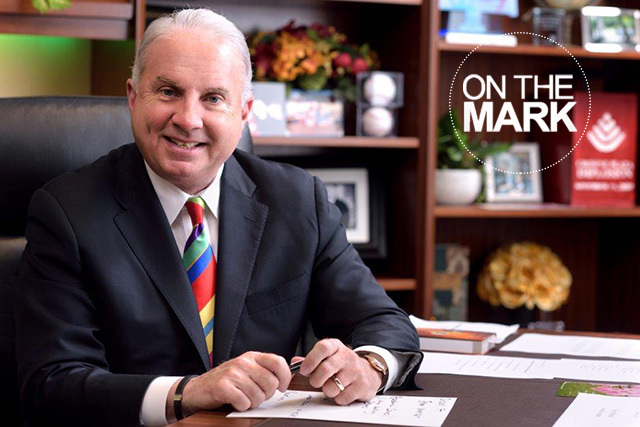 Click here to learn more about suicide prevention. Click here to become more involved in suicide prevention awareness. 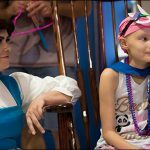 On Tuesday, September 25, Texas Children’s No. 1 ranked Heart Center will open in Legacy Tower. 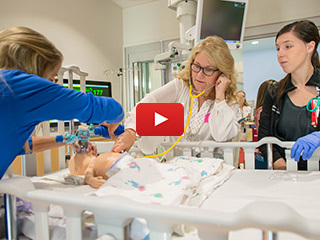 To prepare for this historic milestone, multidisciplinary teams recently conducted simulations in the cardiovascular intensive care unit and cardiovascular operating room to test out the new patient care spaces before real patients are seen. 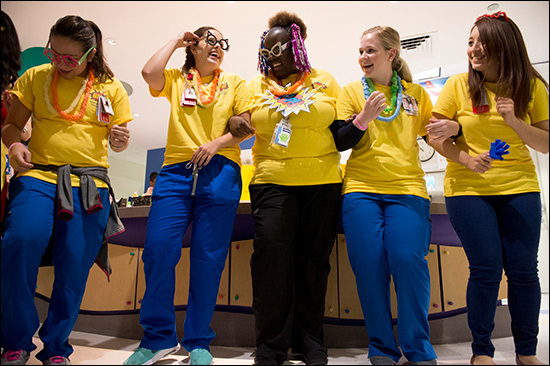 In addition to multidisciplinary staff, patient families from Texas Children’s Family Advisory Committee participated in the CVICU simulations and provided their perspective on how much this space is going to change the way that care is provided to heart patients and their families at Legacy Tower. 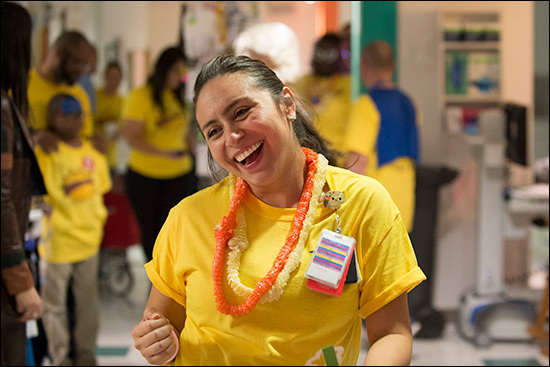 Following the CVICU simulations, Texas Children’s conducted patient care simulations in the CVOR to test the system, the work flow processes, the placement of surgical equipment, as well as test the communication among multidisciplinary teams to ensure everyone and everything is ready before the first CVOR in Legacy Tower. 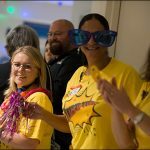 “For the CVOR, we had one patient but that patient was going through all of the different aspects of being a patient from registration to preoperative care to arrival to being in the operating room,” Doughty said. 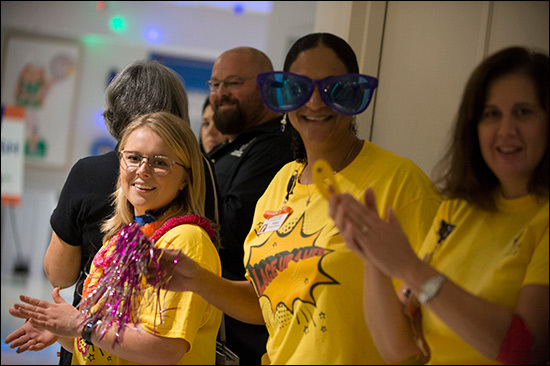 Following each simulation, a one-hour debrief was held where staff from different disciplines came together to discuss what went well and what system processes need to be corrected before actual patients are seen. “We want to make sure we’re well prepared, that the space is in tip top shape to be able to provide what we need for these critical patients,” said Kerry Sembera, assistant director of clinical practice for the Heart Center. 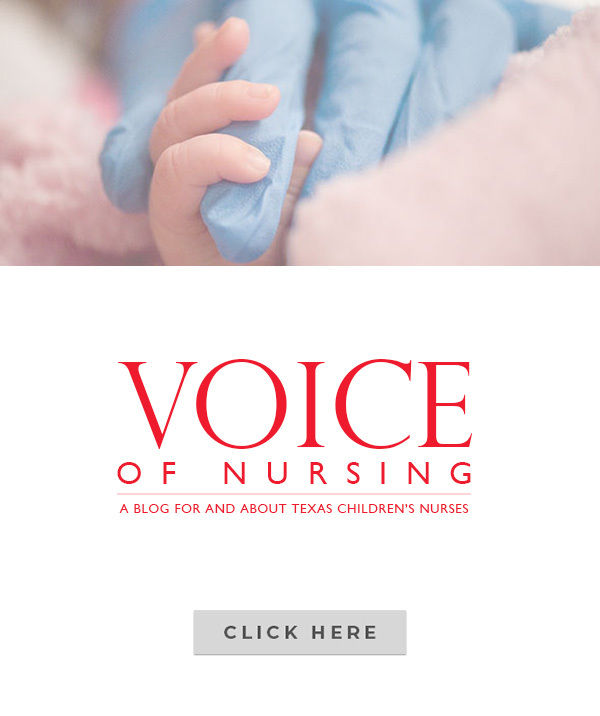 In preparation for the opening of Texas Children’s No. 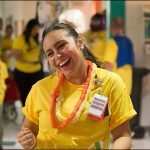 1 ranked Heart Center on September 25, a series of systems testing was also conducted last month for acute care cardiology, the Heart Center Clinic and the Cath lab/HCRU. Employees and staff can see more of Legacy Tower on Connect throughout the month. 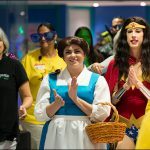 Texas Children’s Corporate Communications Team will feature a series of stories and videos on Connect promoting the Heart Center and sharing how we are preparing for this historic move into Legacy Tower. 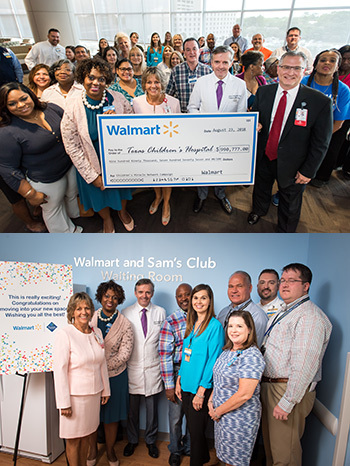 On August 23, an excited group of Walmart and Sam’s Club employees visited Texas Children’s for a special presentation and ribbon cutting for the Walmart and Sam’s Club Waiting Room on the 20th floor of Legacy Tower and part of the new Texas Children’s Heart Center®. 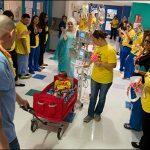 They were welcomed by Chief of Pediatric Cardiology Dr. Daniel Penny, Vice President Judy Swanson and Texas Children’s Executive Vice President Mark Mullarkey, who spoke about Texas Children’s special partnership with Walmart and Sam’s Club through the Children’s Miracle Network. 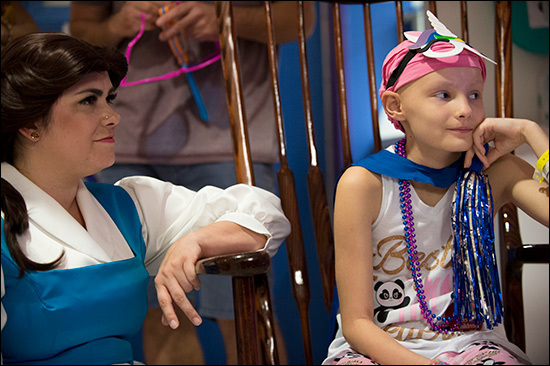 Even with a crowd of more than 30 attendees, there was plenty of room to move in the expansive new waiting area, which was specially designed as a haven for families with children who are dealing with some of the most complex medical issues – children like 11-year-old Jhett Skaggs, a Texas Children’s patient from Oklahoma, who with his dad, Brian, attended the event. 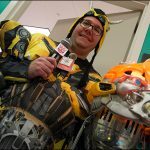 Brian shared their story. 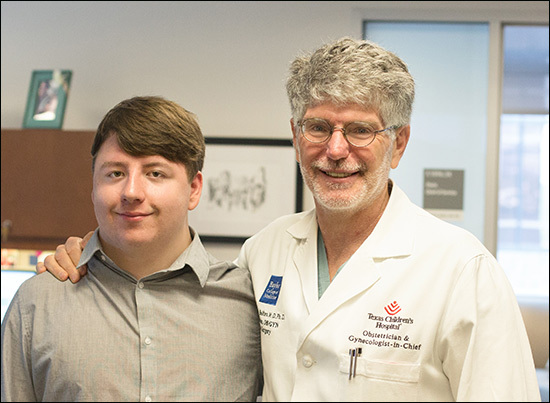 Jhett was born with cardiomyopathy, a rare heart disease. 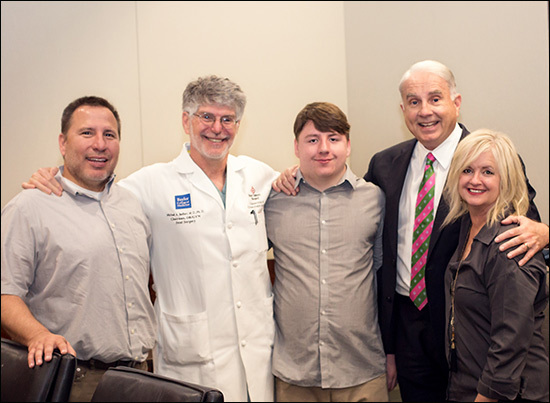 Doctors told Brian and his wife, Audra, that Jhett needed a life-saving heart transplant. 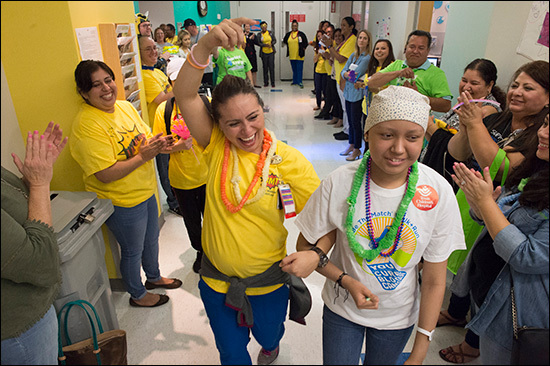 They began researching options for treatment and decided Texas Children’s was the best choice. 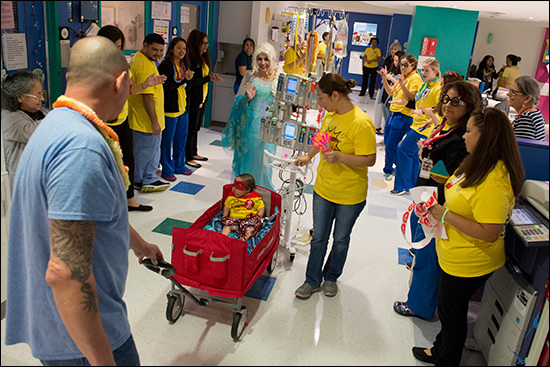 Experts from Texas Children’s flew to Oklahoma to transport Jhett to Houston, where he received a heart transplant at just 10 months old. For years, everything seemed to be okay, until at age 5 Jhett developed coronary artery disease. He would require another transplant. 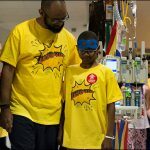 In 2012, Brian and Jhett moved to Houston to be closer to Texas Children’s. 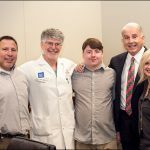 And though they had to wait nearly six years, Jhett finally received his second heart this past July. 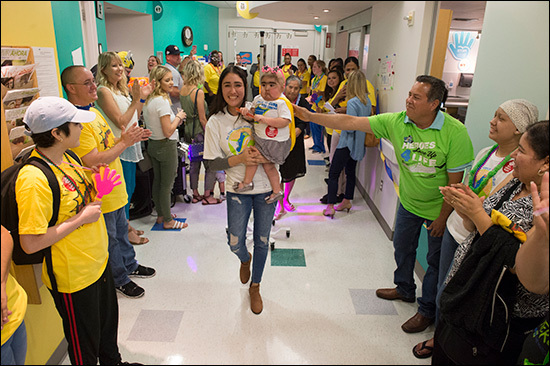 After Brian’s moving story, Mullarkey turned the floor over to Trina Greer, Walmart Regional Vice President of Human Resources, who presented Texas Children’s with a check for nearly $1 million. Since 2005, Walmart and Sam’s Club have contributed more than $9.2 million. 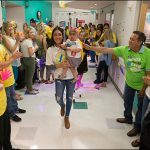 Last year, in addition to the funds raised in Houston area stores, the Walmart Foundation also gave Texas Children’s a gift of $500,000 for Hurricane Harvey Relief. 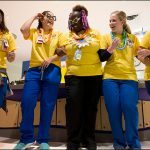 In appreciation of this generosity, Texas Children’s leadership decided to dedicate the Heart Center’s new waiting area in honor of Walmart and Sam’s Club. The new Heart Center – set to open on September 25 – will occupy eight floors and will feature four cardiac catheterization labs including integrated MRI scanner, four cardiovascular operating rooms, three cardiovascular ICU floors with 48 private rooms, two cardiac acute care floors with 42 private patient rooms, and a dedicated space for families. 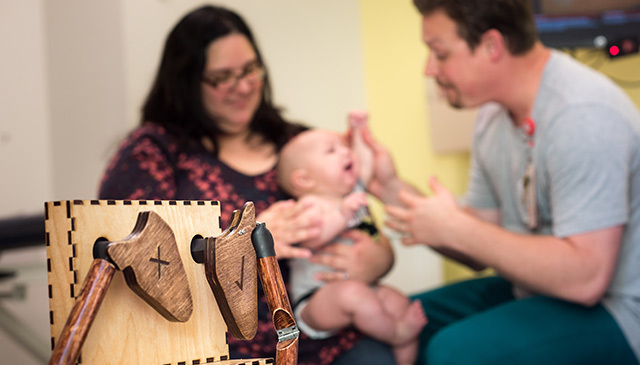 The Southwest Pediatric Device Consortium (SWPDC), anchored at Texas Children’s Hospital and Baylor College of Medicine, recently received a prestigious P50 grant from the U.S. Food and Drug Administration. 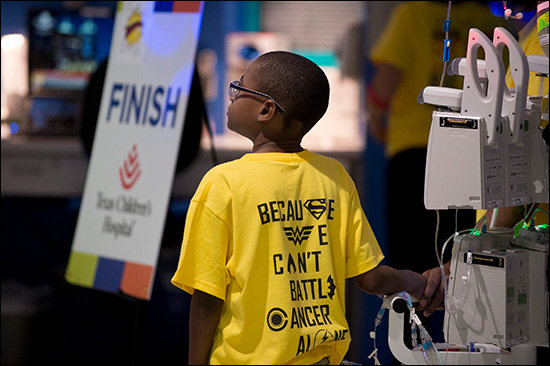 The five-year, $6.75 million grant will begin on September 1 and will allow SWPDC to leverage ongoing activities to expand and accelerate the development of much-needed pediatric medical devices. The five principal investigators include Drs. Chester Koh and Henri Justino of Texas Children’s and Baylor, Dr. Balakrishna Haridas of Texas A&M University, Dr. Maria Oden of Rice University, and Dr. Michael Heffernan of Fannin Innovation Studio. 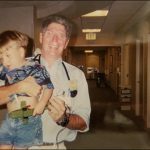 SWPDC supports pediatric device innovators with the goal of addressing the shortage of needed novel medical devices for children, a public health problem that has been acknowledged by the FDA. The past decade has been a period of growth in adult medical device innovation. 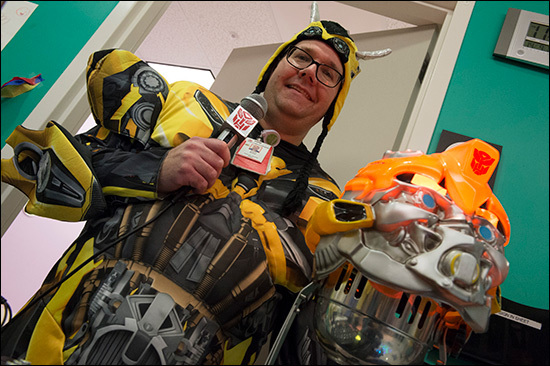 Advances in devices for children, however, have lagged far behind. Why the disparity? Economics are partially to blame. The market for pediatric devices is smaller, and thus the return on investment lower. Then there are the clinical and regulatory challenges. Pediatric device projects may need an extended life cycle before they can be approved and exposed to the external market. 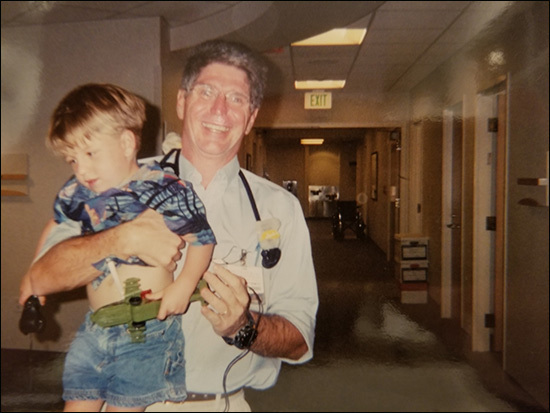 As a result, pediatric surgeons and pediatricians have had to make do with what’s available, often using retooled adult medical devices, and without adequate testing in children. Support from the P50 grant will enable SWPDC to provide services in several areas: unmet needs assessment, prototype development, product and technology acceleration services, and business acceleration services. Consortium members will evaluate and support projects, as well as advise innovators throughout the total product life cycle. Based on individual project needs, the consortium will direct investigators to specific resources, collaborators and industry experts, and will coordinate the services offered by its member programs to identify, evaluate and assist pediatric device projects. SWPDC includes clinical, scientific/engineering, investment, regulatory and academic partners in the Texas Medical Center, the Greater Houston area and the southwestern U.S. Primary partners include Texas A&M University, Rice University, University of Houston and Fannin Innovation Studio, and includes others such as Biotex Inc., Children’s Hospital of San Antonio, Children’s Health in Dallas and Phoenix Children’s Hospital, with additional future sites. SWPDC was selected as one of five national consortia that are addressing the shortage of pediatric devices. 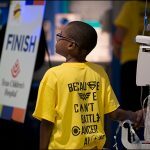 To learn more about the Southwest Pediatric Device Consortium, visit swpdc.org. 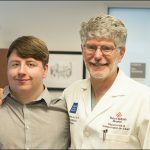 Fetal surgeon and Ob-Gyn-in-chief Dr. Michael Belfort is often reunited with his patients, but the recent meeting he had with Sam Hancock was extra special. 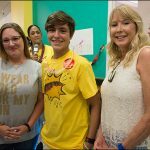 The teenager and his family made their way from Utah to Houston to meet Belfort, who saved Sam’s life before he was even born. 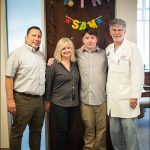 The meeting was Sam’s 18th birthday wish and his parents, Alisa and Dennis, were happy to accommodate as Belfort’s name holds a high regard in their home. 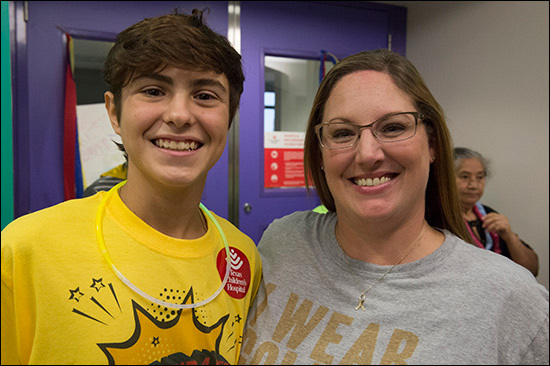 When Alisa was pregnant with Sam nearly two decades ago, an ultrasound showed severe swelling of her son’s neck. Doctors told her and Dennis their baby likely had a very serious condition and would not survive. Later in her pregnancy, doctors noticed fluid building up in Sam’s chest cavity and told her there was no hope. 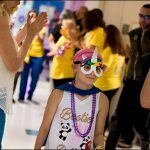 That’s when the family found Belfort, who was practicing in Utah at the time and gave them the option of having fetal surgery. 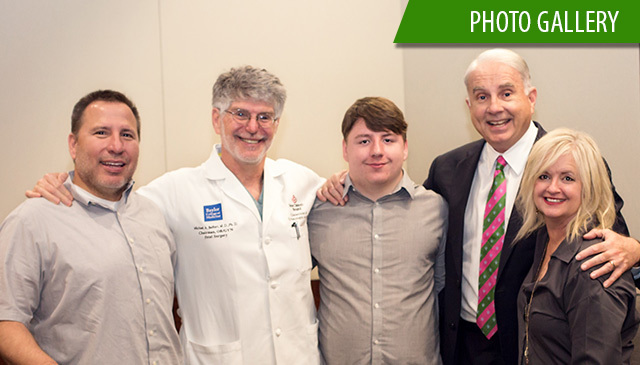 Belfort placed a shunt into Sam’s chest in hopes that fluid being produced would drain from his chest into the amniotic sac, relieving the pressure on his developing heart and lungs. The shunt worked for a short time, but then stopped. Belfort made a second attempt and it was successful in draining the fluid and taking the pressure off Sam’s heart and lungs. Sam was delivered two months early as Alisa went into early labor because of extra fluid in her amniotic sac, a condition called polyhydramnios, which stretches the uterus making it extremely large. Despite several attempts to decrease the amount of fluid, labor could not be stopped. 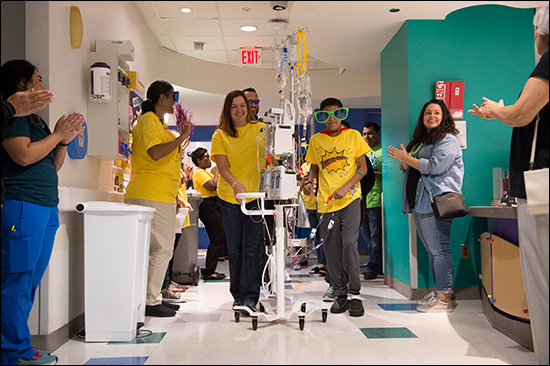 Sam spent three months in the neonatal intensive care unit and underwent another surgery to place drains in his chest to relieve excess fluid. When he was discharged, Sam was on oxygen. At 2 years old, he was diagnosed with craniosynostosis, a condition where the skull bones are fused and cause a misshapen head. 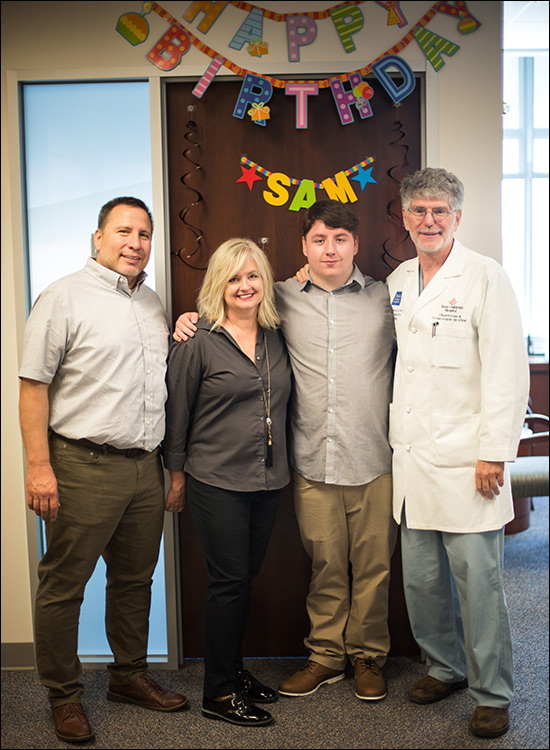 To correct the condition and to relieve pressure on his brain, Sam underwent yet another surgery. Despite a rough start in life, Sam is a fighter. Though he battled some academic delays earlier in life, he worked hard to overcome his challenges and recently graduated with a 3.5 GPA and earned his Eagle Scout award. 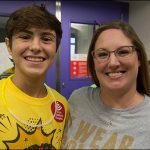 When asked what he wanted for his 18th birthday, he said he wanted to come to Houston to see Belfort, and to thank him for saving his life and never giving up on him. Belfort said meeting back up with Sam and his family was a real treat and that he had never forgotten them. 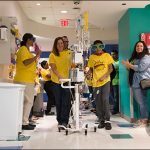 During his visit to Houston, Belfort gave Sam and his family a tour of Texas Children’s Hospital and introduced them to Texas Children’s President and CEO Mark Wallace, who was so honored to meet Sam he personally sang Happy Birthday to the teenager. After talking to Sam about his hopes and dreams, Wallace told him about his 10 leadership maxims and encouraged him to come up with his own personal definition of leadership. Sam, who is looking forward to the next journey in his life and will soon be looking for a job, promised Wallace he would work on coming up with his personal definition of leadership and share it with him soon.